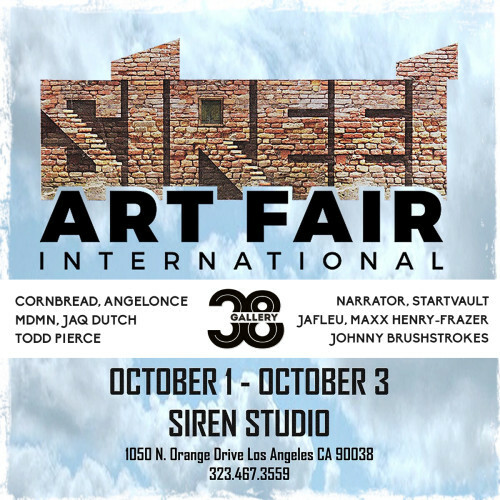 Gallery 38 will be featuring some of it’s favorite artists, including Cornbread, AngelOnce, Jaq Dutch, Todd Pierce, Narrator, Startvault, Jason Fleurant, Maxx Henry-Frazer, Johnny Brushstrokes, at the first inaugural Street Art Fair this weekend. Autograph sessions and photos with the artists throughout event. Direct sales to the general public and unique access to the most famous Street Artists in the world. Music from top DJs performing live pumped throughout the event. World famous painter and a Celebrity will collaborate LIVE to create a work of art that will be sold during a live streaming auction to millions around the world…with proceeds benefiting a charity of their choice. Music, Live Art demos and Heavy Hors d’Oeuvres provided by Berri’s Cafe. Autograph sessions and photos with the artists throughout the event. GIFTS GIVEAWAYS and MORE Everyday!